Calling all Medford residents that like summer and good music — Gazebo Jams season is back. This event has been running for more than 15 years and attracts music fans from all over the spectrum. Longenecker is in charge of Gazebo Jams. She will also be accompanied this year by her friend Karen Kramer. Unlike previous years when it was held on Friday nights, this weekly event will be held at the Main Street Gazebo on Tuesday evenings from 7:30–9:30 p.m. The Medford Arts Center will be open for inclement weather, which includes rain, excessive heat and too many overly friendly mosquitoes. The MAC will also be allowing folks who attend to use its restrooms. The first Jam of the summer was on June 23, and they will continue tonight, June 30 and all the way through August, concluding on the final Tuesday of the month. There will be 10 Gazebo Jams throughout the summer. The event began as a leisurely activity and has remained a casual service to the town. It has never been geared toward raising money or awareness for a cause. “Everyone loves it and the township is very supportive,” Longenecker said. The crowds differ from week to week, sometimes just drawing a few musicians and other times hosting 20 to 25 performances. It is all volunteer musicians playing this music in a ‘”jam” format, as the musicians described it. A “jam” is when people just come out for the enjoyment of the music and to pick up tunes and pointers from the musicians performing. “Folks often bring out lawn chairs and blankets, they love to just come and listen,” Longenecker said. 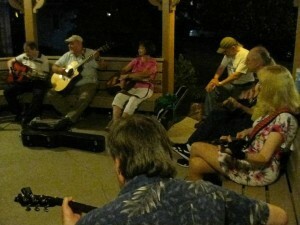 All audiences of music are welcomed to play or to attend and enjoy the music at Gazebo Park. Folks who are interested in playing do not need to qualify or sign up, just need to come ready to share their music with others.